OAKLAND, Calif. — Port board members got an earful from workers and local residents at a May 2 public hearing on the Comprehensive Truck Management Plan the Port of Oakland is preparing as part of its overall program to clean up air pollution plaguing the port and surrounding neighborhoods. In a peaceful, yet very loud protest, port truck drivers, environmentalists, unionists, faith-based activists and West Oakland community residents marched into the hearing room, chanting “Good jobs, clean air!” That’s the slogan of the broad movement which for over two years has insisted the truck management plan must be sustainable and that costs to comply with new regulations must not fall on independent drivers whose incomes, after expenses, are often near minimum wage. The letter cited a study commissioned by the port, that concluded the most effective way to meet upcoming air quality regulations and improve efficiency and security would be for port trucking companies to hire drivers as employees rather than keeping them as independent contractors, as most are now, and for the trucking industry to be directly responsible for the costs. The study, by Beacon Economics, found up to 81 percent of trucks serving the port could need replacement or retrofitting to meet new California Air Resources Board regulations. The Port of Los Angeles last year decided to require trucking firms to apply for concessions at the port and to take responsibility for new vehicles by hiring drivers as employees. Trucking companies, shippers and retailers are strongly opposed, and the American Trucking Association is challenging the plan in court. 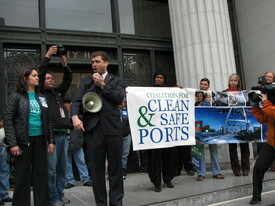 The Teamsters Union participates in the Coalition for Clean and Safe Ports, and several teamsters were among the demonstrators. “[The independent drivers] do the same work we do,” said Steve Gibson. 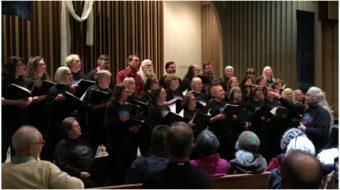 “Why not bring them up to our standards?” Gibson said drivers “work at Ground Zero” for pollution, and cleaning up the air is urgent for port workers as well as the surrounding community. The port’s Maritime Committee will hear the plan May 26, and final board approval is slated for June 2.